On January 24, 2003, the Doverlane Music conference, one of the most prestigious annual festivals in North Indian Music, presented a female Western musician playing a western instrument for the first time in its 51-year old history….Saskia Rao-de Haas’ alap exposition was revelatory, with the faster tempo the icing on the cake.’ Excerpts from the book, “The Dawn of Indian Music in the West” by Peter Lavezolli. Saskia Rao - de Haas is a brilliant cellist and composer from the Netherlands. She has introduced her innovative new instrument, the Indian cello, to North Indian classical music and created a unique playing style to perform Indian music on the cello. Saskia, although born in Holland, performs at the most prominent Music Festivals and Concert halls the world over as a virtuoso of Indian Classical music. Critics and audiences alike have praised her for artistic depth and technical virtuosity. Saskia started learning the cello at the age of 8 from the late cello maestro Tibor de Machula. In her youth she participated in many orchestra and chamber music camps in the Netherlands and the US. Her interest in Indian classical music took root when she was studying for her masters degree at the University of Amsterdam. To complete her thesis, she came to India in 1994, where she commenced her learning process of Indian Music from the late Dr. Sumati Mutatkar and Delhi University. During her subsequent visits to India she had the privilege to study with the eminent artistes Pt D.K. Datar of Bombay, (late) Pt Deepak Chowdhury of Calcutta and Pt. Shubhendra Rao. She simultaneously did her degree at the conservatory of Rotterdam where she studied with Koustav Roy and Pt. Hariprasad Chaurasia. Her thesis from the University of Amsterdam explored the different uses of notation in Indian music and on the possibilities and impossibilities of the sargam notation. 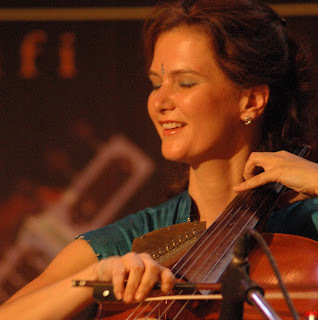 At the conservatory of Rotterdam Saskia studied under cellist Ubaldo Arcari and taught Indian Music History until she emigrated to India to commence her successful performing career as an Indian musician. My journey with the cello started when I was eight years old. Being brought up in a family of musicians and music lovers in Holland and since I showed the required talent, it was understood from early onwards that I would become involved with music. But Indian music? That came as a surprise to all, not in the least to me! Maybe I did already fulfill one requirement: I have always been more at ease to play music by ear than sight reading. I would like to share one anecdote: For the first two years of my learning Western Classical music, I could not read musical scores. This was not a shortcoming I was aware of since my teacher always played the music himself and I just imitated him by ear. For two years this went on without any problem, until he asked me one day to play something from the sheet music. I could not, because I was accustomed to learning music by ear! I think this prepared me for my Indian music career. I studied Musicology in Amsterdam, and my life changing experience took place during a lesson about Indian music by Prof. Rokus de Groot when he played Indian classical music. Little did I expect the impact this music would have on my life at that time…Learning Indian music involved so much more than just learning the music! The music has irrevocably changed me. In an interview, Pt. Hariprasad Chaurasia gave me a greatly cherished compliment by saying that ‘She is Indian because of her music’. Learning music is a process that never stops. I think the day I feel I know it all, I should change my profession. Fortunately I am sure this day will never come since the depth of the music slowly unfolds itself with time and dedication. I often get questions about learning Indian music versus learning Western music. When I started Indian music, I had to literally start re-learning my instrument. Sitting on the floor and a different tuning were the two obvious differences but the easiest to overcome. The other re-evaluations were a complete change in left and right hand techniques I gradually developed for the cello and the understanding of the music esthetics and structure. Tibor de Machula, was one of the greatest cellists of his time in Europe and what I remember from his lessons is that anything you play, you can play it with feeling...even if it is a simple scale. Once I was reluctant to practice the scales and he then gave me a demonstration of where simple scales were used in famous cello-concertos. This demonstration was so beautiful and valid, from that point onwards I never hesitated to practice the scales. I met Pt. Hariprasad Chaurasia in the Netherlands as he is the artistic director of the Indian music department at the conservatory of Rotterdam. His phenomenal musicianship, dedication to the music and its transmission impressed me tremendously. I am eternally grateful for every second he has spent on teaching me and his blessings mean a lot to me. One memory might be interesting to recount. One morning at the conservatory I had decided to come a little early so I could warm up properly before his class. No other teachers or students were yet in the building, or so I thought! I entered the room, and there he was; doing his riyaz ( practise) before any of the students were there! Hariji gave me some very valuable advice that day. He told me I had to develop a style that would be unique to the cello and not to copy anyone else. My work was, he said, was to find out what suited my instrument best. During my first visit to Delhi I met the distinguished vocalist and musicologist Dr. Sumati Mutatkar who showed me how vast and deep rooted Indian music is and yet does not sacrifice innovation! It truly is a dynamic tradition, evolving with time. At that time doctor Mutatkar was 79. She told me that if she would have been a few years younger she would have wanted to learn how to play the cello herself, since she felt it was so suitable for Indian music! The most important lesson she taught me was the path of submission to the music, because practicing music is a musician’s sadhana; it is one’s offering to God. Shubhendra Rao is my husband, my partner in music and one of the most brilliant artists today. Everyday I learn from him-through his talim, listening to his practice, composing together and talking about music. We live our music together. Three other artistes I want to mention here as they have shared their valuable knowledge with me are; Pt. Deepak Chowdury, the wonderful sitarist, Pt. D.K. Dattar one of the most lyrical violinists of North Indian music and Shri Koustav Roy who saw me right from my first steps in Indian music and spent so much of his valuable time with me. Kaustav Roy recides in the Netherlands and has trained many aspiring musicians in Indian music there. The journey of learning never will end and the blessings of my mentors is my strength. When I play my music, I think of them. Whatever I play right is because of them, the mistakes are all my own. In Indian music I follow the Maihar Gharana, to which Pt. Hariprasad Chaurasia, Pt. Deepak Chawdhury and Pt. Shubhendra Rao belong. The literal translation of Gharana is ‘household’ and in musical terms it indicates a certain interpretation of the raga’s, a specific performance format and often other characteristics as well. In the Maihar Gharana the musicians often open the concert with a long alap, as is often heard in the Dhrupad style, followed by different compositions that are often set to rhythmically challenging tala’s ( meter/ rhythmic cycle). A lot of importance in the performance is given to the interaction between the tabla player and the soloist. The doyens of this Gharana are: Baba Allaudin Khan ( founder), Pt Ravi Shankar and Ustad Ali Akbar Khan and Anapurna Devi. My inspiration is not confided to a few musicians, but extends to the entire field of music and experiential world. The sound of nature, different styles of music, different Indian Classical musicians and even a child singing: every moment can transform itself into a valuable lesson.